Photos of Les Sables d'Olonne. Les Sables d'Olonne (lay sab do lon) situated on the Atlantic coast about half way down the Vendée is one of France's original holiday destinations. 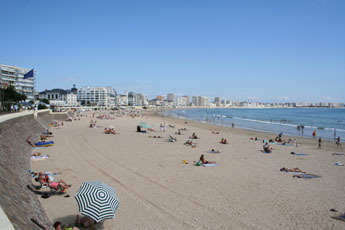 The town is dominated by the magnificent stretch of sand of the Grand Plage and the promenade that runs along its full length which still has many of the classic Victorian buildings remaining. 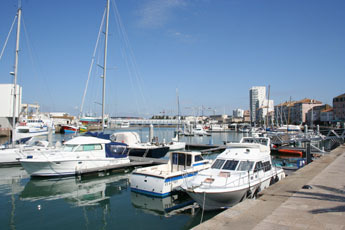 Les Sables d'Olonne has a thriving fishing port and world class marina. In the Roman era there was no land on the site where Les Sables d'Olonne now stands. Founded in 1218 by Savary Ler de Mauleon, Lord of Mauleon, it was then separated from the town of Olonne, but Louis X1 in 1472 decreed that a harbour should be dug, This thrived initially as a whaling port, until by the 17th century it was France's largest port for landing cod with over 14,000 inhabitants (today the population is approx 16,000). In 1825 the first bathing establishments were formed which flourished until today it is one of the finest resorts on the Atlantic coast. Train services started in December 1866 with express services to Paris in following in 1971 and the TVG in 2008. The Port was destroyed by the Germans on 27th August 1944 as they evacuated the town. Les Sables d'Olonne is home to the internationally renowned "Vendée Globe" the world’s most prestigious single handed around the world race which is held every 4 years, leaving in November and circumnavigating the globe without assistance before returning in January. The month before the race the Vendée globe village is opened to the public and it is an event not to be missed. Water sports as one would expect are very prominent here from (the) beach games and swimming to surfing, land yachts, wind surfing all manner of sailing from dingy sailing up to ocean yachts. Whether you want to participate or just watch you will not be disappointed. Apart from sports, Les Sables has a great variety of other interesting things to see and they including a very good zoo, a boat trip to the Marais Saline, many historic buildings and art galleries and with interesting walks not to forget shopping in the small winding back streets or the regular markets Les Sables d’Olonne is a town which has something for everyone. Check the full list of activities including sports. Eating out is one of life’s great pleasures, and you will not be disappointed here in Les Sables d'Olonne. There are a wealth of restaurants catering for all tastes and budgets. There are excellent fish restaurants that face the fishing port and the new marina which has become a favourite with many, or one can stroll around the main marina where there are many interesting eateries. A trip across the harbour to Chaume is recommended, however it may be easier to catch the ferry across the harbour to Chaume rather than walk around. Above all Les Sables-d'Olonne is a beach resort and as such it has one of the finest beaches in the Vendée, which stretch from the harbour mouth to the beaches at la Tanchet where surfing is king. La Corniche. The rocky coastline that runs south has walks, a cycle track and is a pleasant drive along the coast. Abbaye st.Jean d'Orbestier. Dating from 1107 this ancient abbey facing the sea makes an interesting detour. Musee de l'Abbaye de St.Croix. In the former Benedictine convent, is a temporary art gallery as well as a collection of prehistoric artefacts, traditional costumes and model ships. Museum du Coquillage. This museum is devoted to sea shells and has over 45,000 of them and contrary to expectation is a fascinating place to spend some enchanting hours. Camping; Camping des Dunes, La paracou. Tel.02 51 32 31 21. Camping les Roses. Rue Roses. Tel. 02 51 95 10 42. Cycles Evasion. 32, rue Alcide Gabaret. Tel. 02 51 20 15 64. Holiday Bikes. 66 Prom. Georges Clemenceau. Tel. 02 51 32 64 15. Taxi - BEAUFFRETON Bruno 28 Rue Gilbert Bécaud Chateau d'Olonne Tel. : 06 07 59 60 30. Taxis Olonnais 7 Rue Basse Tonnelle OLONNE SUR MER Tel: 06 80 66 15 40. Taxi Aireau 20 Rue Jean Bart LE CHÂTEAU D'OLONNE Tel: 06 80 04 47 32. Taxi - ABRAHAM Patrice 181 Rue Joseph Bénatier Les Sables d'Olonne Tel: 02 51 96 97 08. Taxi - BONNAUD Didier 61 Rue Fleurie Les Sables d'Olonne. Tel: 06 86 89 08 07. Taxi - PASCAL 3 Allée des Lierres OLONNE SUR MER Phone : 06 62 12 29 56.